Its people, not its products that make Starbucks, Starbucks. During the conversation, I discussed how the “employee experience matters” at Starbucks because the company recognizes competitors can replicate the products Starbucks serves, but competitors can’t replicate the Starbucks people serving their products to customers. 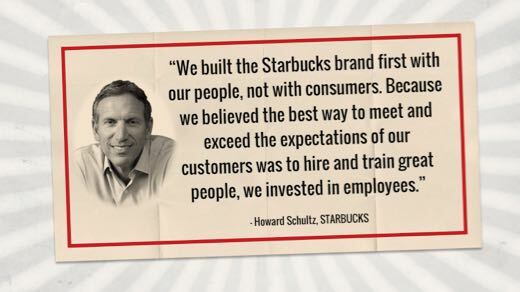 Just as Howard said in the above quote, Starbucks seeks to connect first with employees and second with customers. WHY? Well, simply put … Starbucks knows employees that are treated well, will in turn, treat customers well. To treat its workforce well, Starbucks offers all full-time and part-time employees the opportunity to receive full healthcare benefits, stock options/discounted stock purchase plans, and other meaningful benefits. The company’s reputation for being an employer of choice has been recognized countless times. Most recently, in January 2007, Starbucks was ranked as the 16th “Best Company to Work For in America” by Fortune Magazine. Following my presentation, I was asked when Howard shared this quote about putting employees ahead of customers. The CEO who asked the question wanted to know if this was said in hindsight or with foresight. However, the reality is this Employee First philosophy was articulated as such early on in Starbucks history back when Howard was operating his Il Giornale coffee bar venture. I bring this to our attention because it was at Il Giornale where Howard Schultz clearly articulated the Employee First philosophy which has since become an integral part of the Starbucks company culture ethos. So … the Starbucks Employee First philosophy was indeed created with foresight. For more, read this vintage Il Giornale internal memo.